I think this is one of the hardest concepts to get to grips with in Buddhism and potentially it brings emotions with it. Fear, Sadness, sometimes anger, aversion etc. Remember that the Buddhist approach is very much a process. Through the practise of meditation and the eight-fold path we change ourselves. One of the areas of change and key to progress is the perception of self. As we practice we begin, experiencing through the lifting of our own delusion, to see that there is no self. Nothing permanent about us that pervades through life and this leads to a deeper connection with the world and the people around us. Buddhism is an art of experience rather than faith. So we don’t believe these things because the religion instructs us to. Rather, we set out to explore and find out for ourselves and it is this exploring that means we feel the teaching rather than trying to understand is on the cerebral level. When we come to explore the idea of having no-self we have to explore every aspect of ourselves. We have to consider all of the elements that make us up. We can of course get very scientific about this these days. Considering the atoms and molecules that make us. However, it is rather difficult to actually feel and differentiate between our atomic makeup! Fortunately, philosophy down the ages has given us a vehicle to help with this. 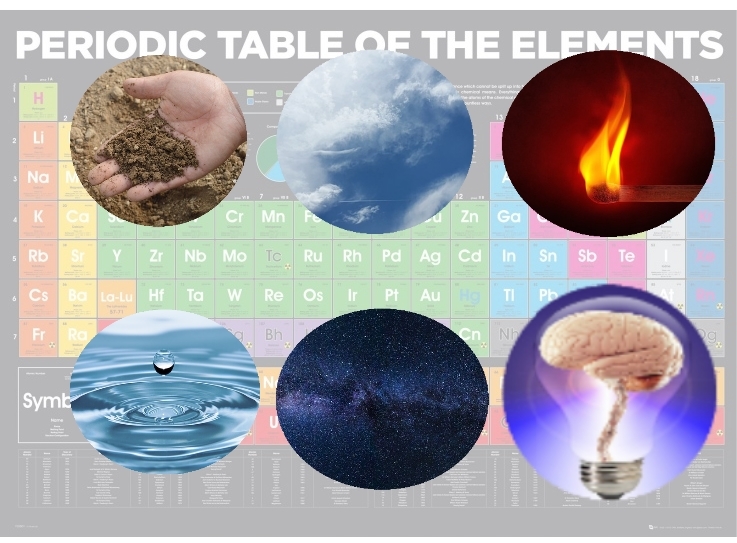 We can consider ourselves from the perspective of the following elements. Earth, air, fire (or heat or energy), water, space and consciousness. In our exploration we take each of these elements in turn and genuinely experience them in ourselves. Genuine experience is key here so we rely on our five senses plus the experience of our mind to explore. As we move through each of these elements experiencing them in our bodies and the world around us, we search for any permanent experience we can find. We try to find something that is permanent and that we can therefore call ‘me’ or ‘I’. Again, this is down in the experiential plane. This is very definitely not an academic exercise. We can use our memories though, to observe those elements that are perhaps a little less changeable than others. For example, the air element is constantly changing as we breathe in and out. But the earth element is present in our bones. We know our bones have changed, as we remember a time when we were much smaller. But we don’t see much change, minute by minute. All this experience is poured in to our meditation. As we work through, we realise how difficult it is to find anything from our experience that can be described as permanent. Earth, air, fire, water and the space elements are all constantly changing. Passing away and being created anew. As an example. The water element actually makes up 72% of our bodies. If there was any element that could stake a claim on contributing to a permanent entity called Andy Spragg, it would be my water element. It is certainly critical to my life. It is the glue that holds me together. Without water, I am just dust. But of course, we can see how ridiculous that is. The water that is in me today, fell from the sky a few weeks ago and I drank it in this morning. I will let it go again in a short time. It most definitely isn’t ‘me’. When we take these elements in they become us. When we drink the water, while it is inside of us, it IS us. Then we let it go and it is no longer us. How does that happen? Don’t theorise or intellectualise the answer. Feel the answer. We approach this practise a little the same as we approached the Koan last week. So we come to consciousness. The mind and the sixth element. It is here that the meditation becomes very interesting. It is of course here that many people believe our identify or something of permanence resides. Are the conscious being and the soul synonymous for example? Before we delve into this question though, let’s take a look at where consciousness resides? The obvious answer to this is in our brain. Mind, brain and consciousness are often assumed to be the same thing. However, if we look at our own experiences we quickly realise this isn’t quite right. Where do we feel our emotions for example? We don’t feel them in our heads. We feel them usually in our heart area or our gut. Extreme emotions can even make our bones ache! In fact, modern biology tells us that our emotions are carried by neuro peptides which are manufactured and carried throughout our bodies. There is also a great deal of evidence to show a lot of the emotional content of our memories are buried deep within the cells of our bodies. It is this that allows us to connect with the whole human ‘beingness’. Close your eyes and try to determine the size and extent of your mind. It’s fascinating that it seems limitless. You can’t find the edge of your mind. It is certainly bigger than your head and also your body. As Buddhists we spend a great deal of time studying the nature of mind. Studying the nature of a thought, a memory, what drives our thoughts and what triggers the memories. Memories have a tendency to fade as we get older. Some are unreliable. Try to hold on to a memory in the mind. They are like gossamer slipping through the fingers. The same with thoughts. Where do they come from and where do they go? Spend a little time meditating and you soon discover how impermanent our conscious experience is. So where are we? Nowhere. What are we? Nothing. But this can’t be right. This intuitively doesn’t feel right and seems rather nihilistic. But it IS our honest experience. That we cannot find anything permanent in our experience and we cannot find ourselves! This is a very good starting point from a Buddhist perspective. There is an old Zen story of a master pouring tea with his student. He keeps pouring and the cup overflows. The student alerts him to this. The master explains that before we can accept anything further into our experience, we must first empty ourselves. I think this is what is meant by this tale. In his book, ‘The Ego Tunnel’ Thomas Mezinger concludes that this emptiness is the way life actually is. He concludes that our perception of self is an illusion created by the nature of our minds. Thomas is a philosopher and neuro scientist and is coming at all this from a very different angle. But he seems to arrive at the same place! To the outsider coming to this, it at first seems rather pessimistic and actually rather disturbing. We are so firmly attached to the idea of self that letting go of this concept is extremely difficult. We cannot envisage a world where there is no ‘me’. To the practising Buddhist, however, this perspective brings great comfort. At the heart of Buddhist teaching is an understanding that we all suffer and much of our suffering is caused by our own desires and grasping approach to life. This suffering is known as ‘Dukkha’ which translates more as ‘general unsatisfactoryness’. Which, actually, is more understandable that the word suffering, which brings with it ideas of intense physical pain which unfortunately some of us do battle with. However, if we are honest with ourselves and sit down and meditate on our lives we do find that we spend a lot of our time in a generally unsatisfactory place. We get brief periods where we are happy and are enjoying the moment. But a great deal of our time is actually spent waiting. Waiting for the next happy moment, waiting for the current unhappy experience to pass. We go grasping for the happy moments and push away the unhappy ones. The ultimate desire of course is the desire to hang on to life. We want to remain healthy and young for ever. There are all manner of products out there that help us either to pretend to ourselves and others that we are retaining our youth or that make promises of extending life. However, never, in the history of man, has anyone cheated death. From the perspective of no-self, the understanding is that we are simply the sum of parts. Off all the things that have happened before that culminate together at this instance in time and create this single moment of ‘Andy Spragg’. Therefore, as there has never been a permanent entity called ‘Andy Spragg’ there is no permanent entity to die. We will never die, as we were never born! This is key to really getting to grips with this concept and anyone interested in this, I would encourage you to begin meditation and ‘feel’ some of this. It really is an eye opener. With our ‘me’ position we feel very much like a separate entity existing in the universe. Our desire to remain young and healthy and live forever grows out of our self perception. What I am encouraging you to do in this article is to take a different perspective. That we are not separate. The elements that make us are not us, but are still very much a part of the Universe. They just happen to occupy the same space at a point in time. When we start to experience this new perspective of no-self a huge feeling of connection with the people and the world around us arises. We are the elements that make us and we connect deeply with everything around us. In this way, as a Buddhist I constantly strive to discourage thoughts of self. Just directing my attention outward at the things I can feel, see, smell, taste and touch and also to experience the nature of mind and how it interrelates with these other senses. In this way, my connection deepens. ← Am I Present Now?